OK everyone, I have to start packing up my PCs and get ready to go to my new home… where there’s no internet… and where I won’t be able to afford to run my own server 24/7. Tonight I’ve moved this site and The Anythings website to a brand new host and they’re working OK for the most part from a simple move. I need to get round to fixing my gallery (again) and also the gallery on the band website isn’t working since the move. Sadly I can’t get on to it until I have internet access at my new home. Anyways I’m saying goodbye for now but it’ll only be for a couple of weeks I’m guessing. There won’t be any updates on here for that long but I’ll keep track of what’s going on so I can then add them all on here when I get online again… then again, I do have limited ‘net access on my phone… hmmm…. UGH! THAT IS SO UNFAIR! Crack open the champagne lads, Wii did it! That’s it! 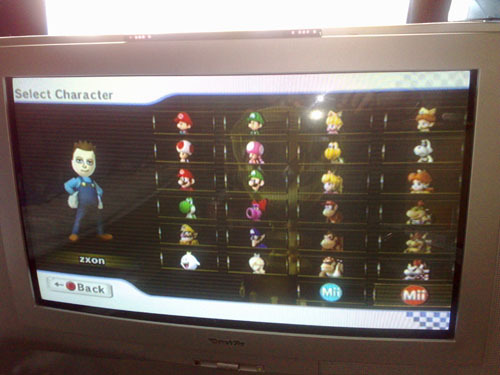 All the characters unlocked in Mario Kart Wii! The only thing I’ve been doing these days is looking for a new home and playing Mario Kart… hence completing it so quickly! Don’t believe me?